i-ELOOP is a regenerative braking system. 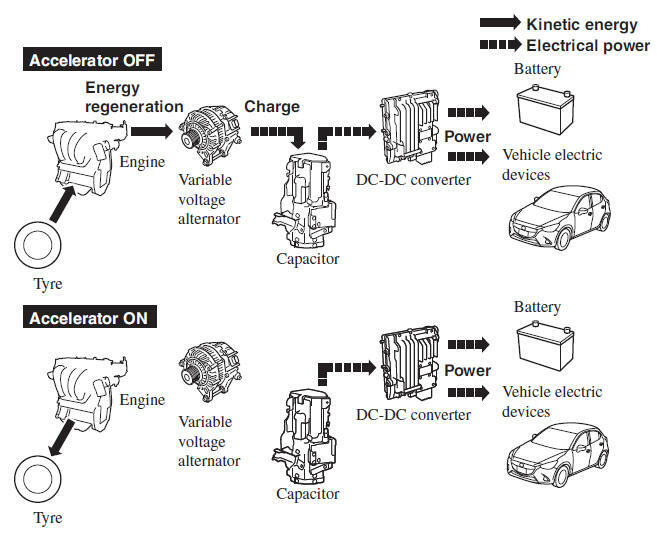 When you depress the brake pedal or use engine braking, the kinetic energy that occurs is converted to electrical energy by the power generator and the converted electrical energy is stored in the storage device. The stored electricity is used as power to charge the battery and the vehicle's electrical devices. A variable voltage alternator is incorporated in the power generator which converts the kinetic energy to electricity and can generate electricity effi ciently according to the vehicle conditions. A capacitor is incorporated in the storage device used for storing the generated electricity, which can store large amounts of electricity instantly and be utilized quickly. A DC-DC converter is incorporated which steps down the stored electricity to voltage useable by the vehicle's electrical devices. High-current electricity fl ows through the following parts, therefore do not touch them. A difference in the fuel economy may occur depending on how the vehicle's electrical devices are used. If the capacitor is to be disposed of, always consult an expert repairer, we recommend an Authorised Mazda Repairer. For details, go to the following URL. The driver is notifi ed of the i-ELOOP power generating status and the vehicle conditions by the i-ELOOP indicator light (green) and the control status display. The i-ELOOP power generating status is displayed in the centre display. Refer to Control Status Display on page 4-90 .